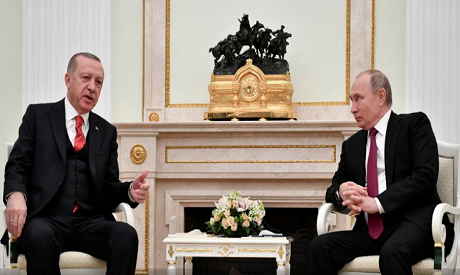 Russian President Vladimir Putin held talks with Turkish President Tayyip Erdogan on Wednesday after which the Russian leader said the two men had discussed how they planned to stabilise the situation in Syria's Idlib province. Putin said the Russian and Turkish defence ministers had already held talks on specific action that the two countries would take in Idlib and that the measures, which he didn't describe, would now be implemented. "Unfortunately there are many problems there and we see them," said Putin, standing alongside Erdogan. He said Turkey was doing a lot to try to remedy the situation, but that more action by both Ankara and Moscow was required to "liquidate the actions of terrorist groups." Putin said he had agreed to host a summit soon where Russia, Turkey and Iran would discuss the situation in Syria. He did not name a date for the summit, but said he and Erdogan had agreed on its provisional timing. The Russian leader also complained about the difficulty of forming a U.N.-sponsored constitutional committee for Syria, saying that France, Germany and Britain had blocked the proposed make-up of the committee in December, a move he said had come as a surprise for Moscow.